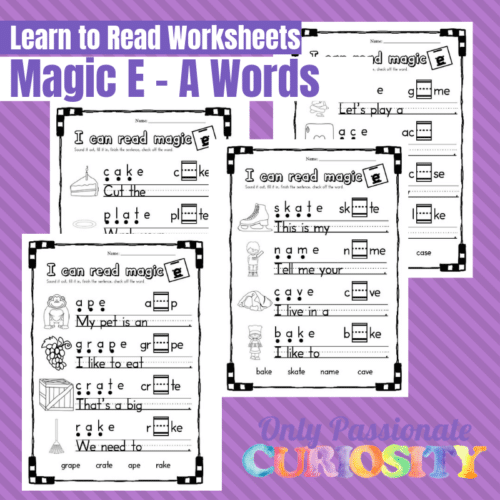 This worksheet pack is designed to help your emergent reader practice reading and writing “magic e” words with the long “a” sound. Using them is easy – just print and go. There are four worksheet pages included. First, have your child place a finger on the dots under the word and sound out the words. 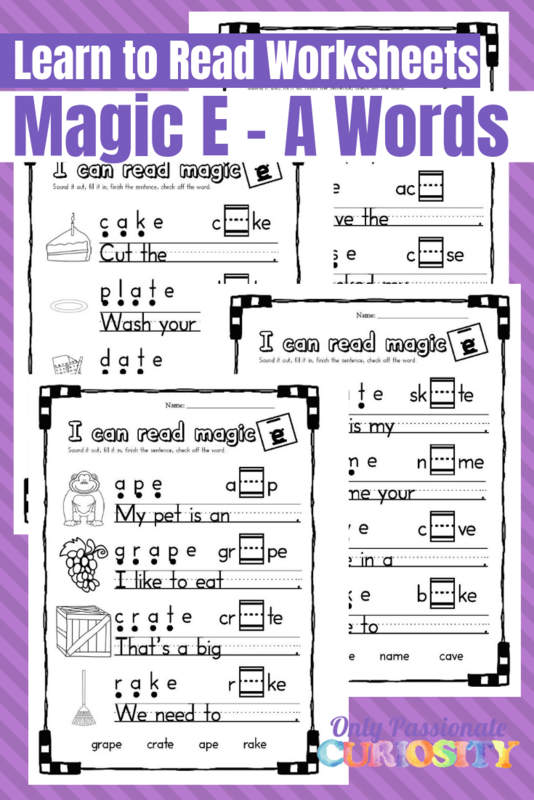 Point out that there is no dot under the letter e – this letter e is “magic” and it forces the vowel to say it’s name. Some kids find it helpful to cross out the e and draw an arrow pointing to the vowel, or to draw a line over the vowel to indicate that it says it’s long sound. Then, have your child write in the vowel in the box to complete the word, and finally, write the word on the line to complete the sentence. My kids like to color the worksheets for some extra fun (that’s why they are always black line pages!) but, to each their own! Your kids can color it, or not. Use one page each day this week! More packs to complete the vowel series will be coming soon to the website. Make sure you subscribe by email so you don’t miss them! Looking for resources to help you homeschool on a budget? Check out our free homeschool list for free and affordable curriculum and printables!